For fabric see interwoven fabrics on replacement fabric page. Price includes twin bed, bookcase, headboard, folding attached desk, desk chair with or without wheels and four drawers under bed. 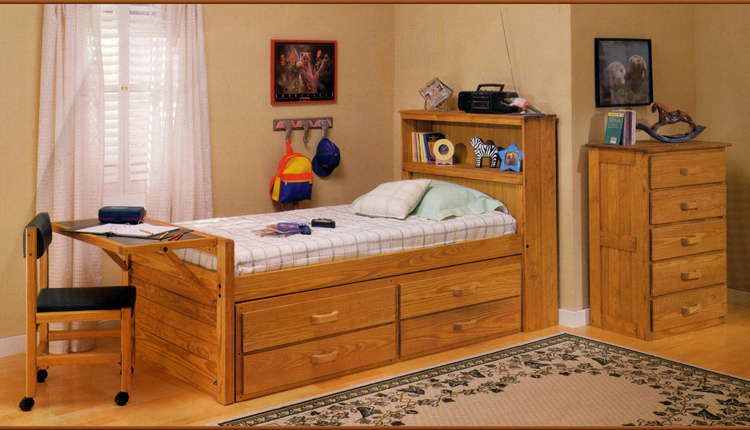 Allow 14" clearance for drawers under bed. You can have a second set of drawers on other side for an additional $195. Minimum quantity of 20 units per order. Freight is based on weight and distance. For lacquer finish (never needing to be waxed) add 20%.